Before we do, though, that cover… Regular listeners of the podcast will already be well aware that Ethan van Sciver is a particular favourite of Jim, Eric and Reggie and, looking at the cover art here, it’s easy to see why. There’s a raw power to the image of the ape hand thrusting towards the sky, the ring glowing on its finger, that is really impressive. The GL corps members hovering in the background look great too – even if their number appears to include a disco ball and a giant onion in a sweater. That the internal artwork doesn’t quite reach van Sciver’s level is a little disappointing but not deal-breakingly so. Barnaby Bagenda’s art is good in its own right. On the whole, it’s dynamic when it matters and faces are reasonably expressive and consistently drawn. The action shifts to the Planet of the Apes-era Earth where a silent Nova stands at the edge of a huge crater caused by the impact of what turns out to be a mysterious glowing ring. She’s met by Cornelius who just happens to be out searching for Taylor. This, I think, means we’re somewhere between the first and second movies (the original ones, that is – not the recent remakes). Cornelius takes the ring back to Zira, but already the ring appears to be exerting an influence on him, briefly turning orange at precisely the moment Cornelius is expressing that he can’t leave something as “precious” as the ring lying in a hole in the ground. Aside from being a perhaps ill-advised call-out to The Lord of the Rings, it does hint at the nature of the ring, which seems to amplify (or instil?) the emotions of those near it. There are further hints in the conversation between Cornelius and Zira that follows. As Cornelius expresses his dismay at the warmongering of Zaius and his determination to prevent the general from acquiring the ring, the ring begins to glow a distinctly redder shade of orange. 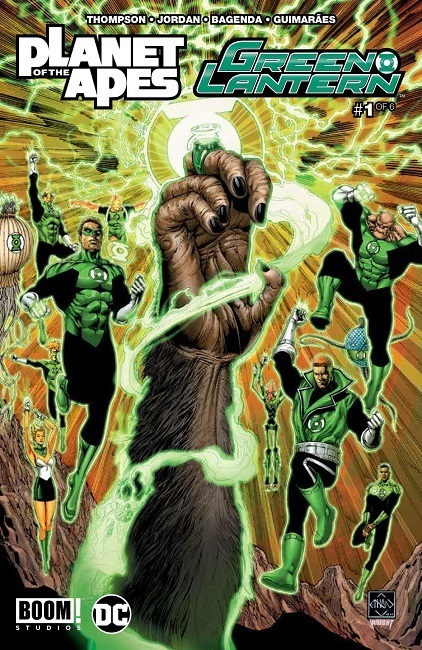 Which is appropriate, because the next thing we see is the Red Lanterns attacking Oa (which, in itself, is a massive clue that this story does not take place in current continuity) because they believe the Greens have taken Bleez. The Green Lanterns respond as you would expect them to. There’s some nice action here as well as some entertaining banter between Guy Gardner and Hal. 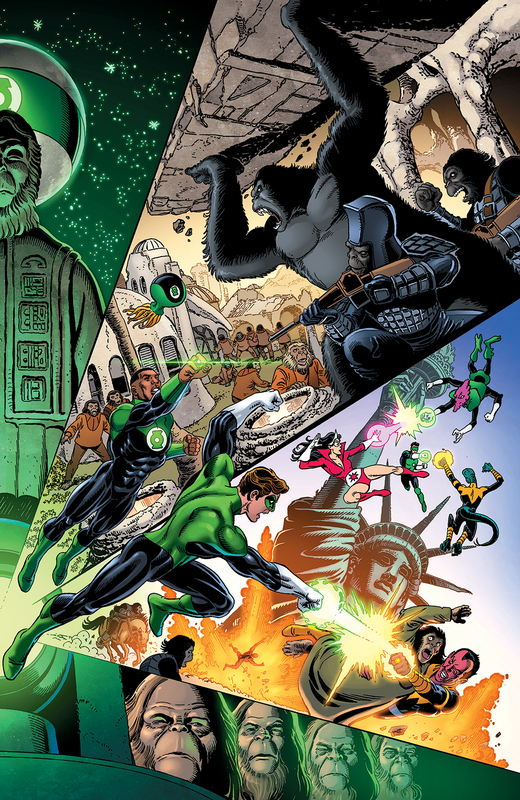 Bagenda’s artwork is pretty impressive here, particularly in the panel in which Dex-Starr attacks Arisia. 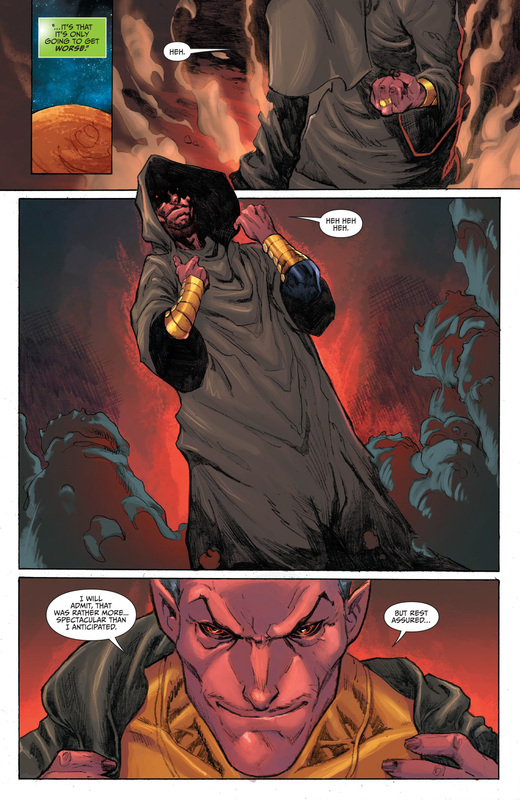 The Green Lanterns deal with the threat of the Reds easily enough and then we’re back to our mysterious hooded figure who reveals himself to be… Sinestro. Of course he is, complete with evil chuckling. We find out that the ritual that started this issue was intended to lead Sinestro to the “universal ring”, presumably the object Cornelius is currently studying. Despite the fact that he still doesn’t possess the ring, he seems pretty happy with himself, the implication being that he knows where it is. Back to Cornelius who wonders if the ring, now glowing a bright ruby red, is reacting to his voice, before deciding to put it on his finger. Dramatic things happen, including Cornelius crying out in pain and, back on Oa, Hal’s ring telling him that a “cross-chronal disruption” has been detected. The Guardians turn up to reassure Hal that it’s absolutely nothing to worry about, although they do refer to a “relic of an ancient security system”, something that sounds like it just might be worth worrying about. Hal, of course, isn’t satisfied with that and sets off to locate the disturbance and finds out that it’s coming from…. Earth. 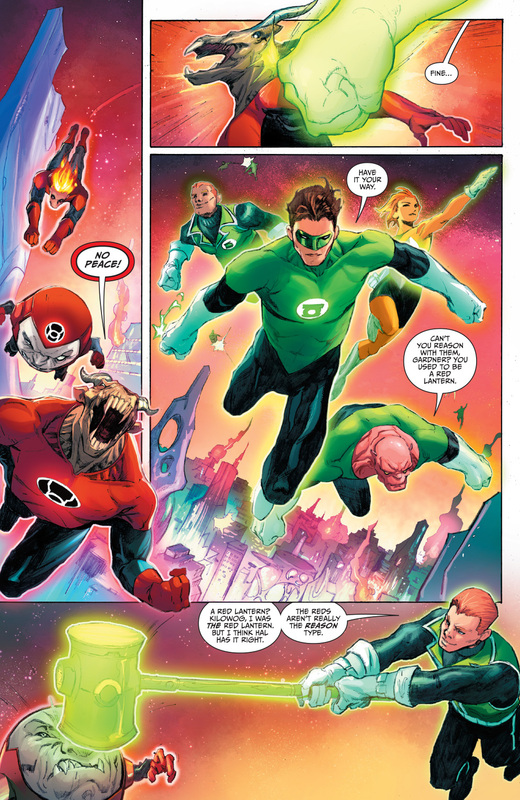 On arriving at his homeworld, Hal gets attacked by Sinestro, who tells him that he has found a “true path to victory”. As their battle unfolds, Cornelius is out in the desert struggling with the ring’s energy that, in a rather nice double-page spread, leaps out of his ring and across universes to disrupt Hal’s fight with Sinestro. Things get weird as Hal’s ring loses power, he plunges into New York harbour and struggles to shore only to find himself on the desolate beach made so famous by the first film’s ending, complete with a half-buried Statue of Liberty. This would be a perfect moment to end the issue, but writers Robbie Thompson and Justin Jordan have one more sting in the tail. Cornelius encounters a group of the underground mutants from the second movie who have been drawn to the power of his ring and the issue ends ominously with the mutants bowing down to him in subservience. Well, that was fun. There are a few issues with this story, but there’s enough going on here to persuade me that picking up the second issue would be a good idea. 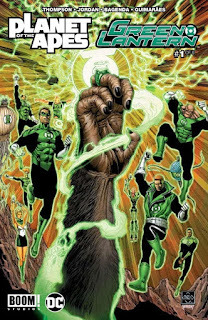 I suppose the main problems with the story are how it might fit into GL continuity and the overwhelming sense that we’re experiencing a “greatest hits” of the Green Lantern Corps. Oa? Check. Hal and Guy banter? Check. Guardians acting like tremendously unhelpful authoritarian dicks? Check. Hal fighting Sinestro? Check. While I’m not overly concerned about how this fits into GL continuity, I do feel that, on the GL side at least, we’re not really getting much new here. At the moment, it’s the Planet of the Apes elements that are hooking me. I was delighted to see the mutants from the second film make an appearance and I’m very intrigued to see where Cornelius’ meeting with them goes. 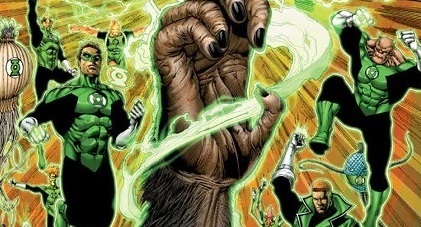 Another issue is that, for readers of the current Green Lanterns series, the concept of the ‘universal ring’ might be just a bit too close for comfort to the phantom ring encountered by Simon Baz and Jessica Cruz in recent issues of their book. How enjoyable you find the issue may ultimately boil down to how irritating you find this and/or the portrayal of the GL Corps. Personally, I enjoyed the issue and think there’s enough impetus here to take the story forward into some interesting places. Bagenda’s art is dramatic when it needs to be and Jordan’s script is easy to follow and, on occasion, witty. The task of bringing two very different fictional universes together is not a straightforward one, and I think, on the whole, the story manages pretty well. Above all, it’s a fun, if not especially challenging, read. It’s worth checking out, particularly if cross-overs are your thing. Gosh, I'd buy this for Barnaby "Omega Men" Bagenda alone.